In this guide we’re rounding up the top VPN services for expatriates. Wherever you’re living in the world, you’ll be able to find the right VPN for your needs. Being an Expat means you’re part of a somewhat exclusive club of those who have the luxury of living abroad. To your friends and family, this probably means they think you live a jet-set lifestyle and while there are definite benefits of living abroad there are also some negatives. As someone who has been an expat myself, I understand that missing home is one of the biggest downfalls and part of that comes with missing TV from home. There’s also the issue of internet security and access depending on what country you’re in. What you can access at home is not always accessible abroad and if you’re an expat in China for example, then you’ll find the internet massively restricted. A VPN can help with both issues but it’s also the answer to many other problems which is why these days it’s essential to use a VPN as an expat. The question is, which one? And which one is right for you? It’s easy to say ‘XYZ’ VPN is the best but is it the best for your needs? There’s no one size fits all. In this guide we’ll be giving you a handful of suggestions from the leading VPN services that are suitable and best tailored for your usage. So while you sit by the pool sipping your cocktail, let’s find out which VPN is best for expats. There are some standout features you should be looking for in a VPN as an expat and below we’ve listed them. Keep these in mind when shopping for a VPN because they’ll make the difference between getting a reliable VPN service over getting something that’s lacking essential features. Range of apps – The expat lifestyle is hectic. Whether you’re working abroad or retired, there’s always lots to do. Having VPN apps keeps things simple. Make sure the VPN service you sign up to offers apps for the types of devices you use. If you need a VPN for your phone make sure it has an Android or Apple iOS app, need it for your Amazon TV then make sure they have apps for that and so on. Servers in your location – Using a VPN will lead to some speed loss but good services mean this stays minimal. By having VPN servers in your country or at the very least in a neighbouring country will limit this speed loss. If you’re in Australia and the nearest server is in India, then you’re going to have a problem. Look for those with plenty of nearby locations. Money back guarantee – VPN services differ in quality for all users. Having a lengthy money back guarantee allows you to test without any risk. There are also a couple of rare providers that have free-trials although this isn’t common. No log policy – When using a VPN all of your data is tunneled through their service. You’re handing them your privacy versus your internet service provider. Ensure that the VPN service you sign up to has a no log policy. Better still, look for those that are “audited” or have proven cases to show their no log policy is worthy. We’ve rounded up our top picks for VPN services for Expats. They offer some of the better services we’ve tested. However, we’re also interested in hearing about any services you’ve used that you felt were beneficial or had negatives for the expat community. Why not pop a comment at the end of this article? ExpressVPN has one of the most extensive ranges of server locations which is great for expats. With servers in over 94 countries, it makes them suitable regardless of what country you live in. They also have one of the most significant ranges of apps covering everything from mobiles and tablets to laptops and computers. Additionally, there’s a VPN app for Amazon Fire TV devices allowing you to watch TV from home. Talking about TV from home they also unblock one of the largest ranges of TV services available. So if you want to watch Netflix, BBC iPlayer, NBC, Sky, BT Sport, Hulu or almost any other service then you’ll have no trouble here. In our recent 2019 VPN speed tests we found ExpressVPN to offer some of the best speeds, so much so that we commended them on this in our latest review. They also took our coveted ‘Editor’s Choice’ award for 2018 and 2019. 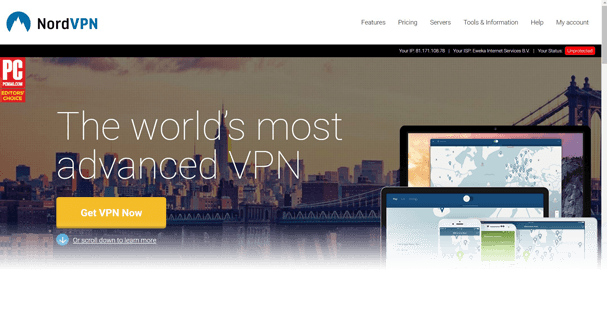 IPVanish is one of the biggest names in the VPN industry and for Expats, they’re one of the best options too. Over the years they’ve built a reputation for a reliable and robust VPN service and with servers available in over 50 locations worldwide they’re suitable almost anywhere on the globe. Apps are available for all the most popular devices covering phones, tablets, computers and the Amazon Fire TV Stick. With ten concurrent connections available you’ll be able to secure all your devices and any family members and unblock content from across the globe. IPVanish isn’t the best for unblocking TV and services like Netflix and BBC iPlayer will be blocked. If that’s your main usage then you’re better sticking with ExpressVPN. There’s a 7-day money back guarantee which although is shorter than other providers should still be plenty of time to test the service. NordVPN offers the right combination of quality service, ease of use and features for those living abroad. There are now well over 5,000 individual VPN servers available giving you plenty of connection choice. The benefit of this is it means their network isn’t overcrowded allowing you to get exceptional speeds. We love the fact the service works well for unblocking streaming and everything from US Netflix to BBC iPlayer, Sky and Hulu works well on the service. If you’re after watching TV from your home country, then it’s one of the best options. Their range of apps are available for all the most popular devices and they’re incredibly easy to use. If you’re new to VPN use, then you’ll find everything easy to set-up and quick to connect. CyberGhost VPN is another good option if you’re an expat who doesn’t want to deal with complicated set-up or is new to VPN use. They’ve got a range of easy-to-use apps with connection options for specific purposes. They have a full variety of options pointing you in the right direction to unblock TV services. Alongside the extensive TV unblocking there’s a secure VPN service with high levels of encryption and apps for all the most popular devices. You can stay secure whether you’re at home or on the move and they’ve even got apps for Fire TV devices too. You can use the service on up to 7 devices at the same time and there’s a lengthy 30-day money back guarantee on top. VyprVPN is one of the oldest and most respected VPN services available and if you’re looking for a consistently good VPN service for use as an expat they’re worth checking out. Unlike other services, they’ve got a free 3-day trial. Put your payment details in to take advantage. There are no restrictions on the free trial and you can use it as if you’ve paid. If it turns out it’s not what you’re after then cancel before the full three days pass and you’ll pay nothing. We like their range of apps and while they don’t support Fire TV devices, they do have VPN apps for Android, Apple iOS, Windows and Mac devices with some of the most beautifully designed and easy to use apps we’ve seen. To protect your privacy overseas they’re now a totally no-log VPN service so what you do while connected remains private. They’ve even been audited to show this claim is valid. Which VPN is best for your needs? As an expat you will have a few common needs, from unblocking services such as entertainment and financial services to protecting the privacy of what you’re doing on the internet. However, depending on your specific usage there could be a VPN service that is more suitable for your particular needs. Our best all-round VPN service for expats is definitely ExpressVPN, and although they’re a dollar or two more expensive than other VPN services they do offer much more in terms of features, speed and ease of use. You may find that for specific needs these VPNs are more suitable. If you want to try without commitment, take VyprVPN. They’ve got a completely free 3-day trial. It gives you access to the full service. You will need to enter some payment details but if you don’t wish to keep the service, you can cancel before the 3-days pass and won’t be charged anything. If you want the most coverage, grab ExpressVPN. With connection points in more than 94 countries there are very few providers who match this number. None of our other recommendations come anywhere close. You’ll be covered no matter which country you find yourself in. If you want the ultimate in ease of use, sign up for NordVPN. Their apps are well designed, easy to use and the best option for new users. 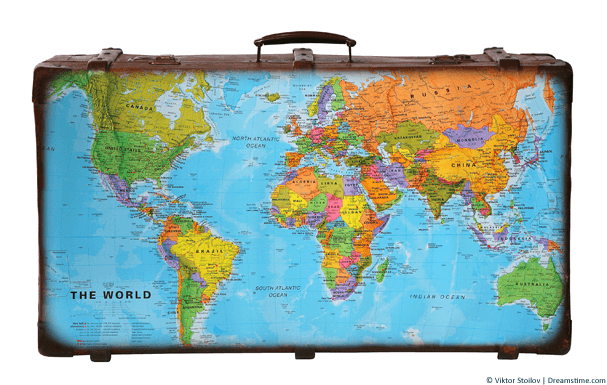 You can connect simply with just one or two clicks and using their helpful map feature you’ll never get stuck for connecting to the country you need. If you want a lightweight service for multiple devices, get CyberGhost VPN. With connections allowed on up to 7 devices and apps for all the most popular devices, you’ll have no trouble getting connected to the right server for your needs here. Using a VPN as an expat is beneficial for numerous reasons, not least because it allows you to keep in touch with the world ‘back home’ through TV services, financial and other websites which you’ll likely find blocked otherwise. Alongside that there’s the genuine threat against your privacy which a VPN will help protect and depending on what country you’re in could even allow you to go about your everyday life without worry. We recommend using ExpressVPN because they offer that little bit more than the competition. They do cost a dollar or two more than some services but in our opinion for all that they offer it’s well worth the tiny amount of extra cash. Ready to get a VPN? Try our recommended Expat VPN service.